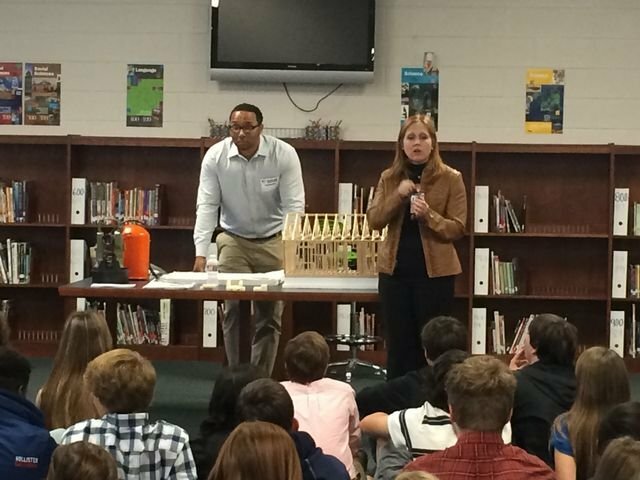 The HMS 9th Grade Academy welcomed Derek Crawford, an instructor of Drafting and Design for Wallace Community College, on Thursday, November 13, 2014 as a guest speaker. Mr. Crawford spoke to the 9th grade students about drafting careers and the duel enrollment program available at Headland High School. He brought some models, blue prints and survey tools to show our students. He answered questions related to the field and different career paths available after obtaining this technical degree. He shared his passion and excitement for the field with the students and encouraged those that possessed an interest in computers, drawing and were creative to research this field and find out it would be a good fit for them. He discussed with the students how this program can lead to careers in engineering, architecture and graphic design/animation. We appreciate Mr. Crawford coming to share with our students.